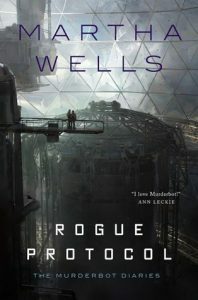 I borrowed a copy of Martha Wells’ Rogue Protocol from the library. I previously reviewed the previous books, All Systems Red and Artificial Condition. I’m still loving Murderbot, the sarcasm and social anxiety works so very well. My complaint here is that the series is starting to feel like a serial, instead of stand-alone novellas. This book references past events and people a lot more than previous ones. Other reviewers complained about this series being broken up from the beginning. But, knowing Tor specializes in novella length works, I understood it and still considered each book a separate entity. This seems to be fading as the series goes on and that makes me sad because I really HATE serializations. That said, I want more and more of Murderbot please. This entry was posted in books/book review and tagged book review, sci-fi on September 27, 2018 by Sadie.